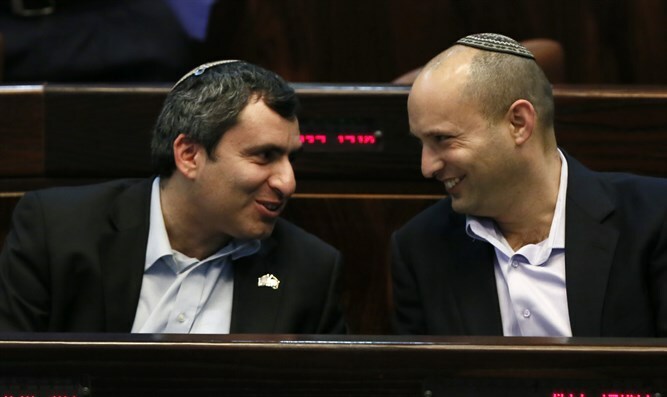 Minister of Education and Chairman of the Jewish Home Naftali Bennett announced on Thursday that his party supports the candidacy of Minister Ze'ev Elkin for mayor of Jerusalem. The party's support included Deputy Mayor Hagit Moshe, who heads the Jewish Home list for the Jerusalem City Council. Bennett explained, "My friend Ze'ev Elkin is the right choice for the Jerusalem public - a national figure with a clear right-wing outlook, who has worked hard for the people of Israel and the State of Israel throughout his many years in the public arena." "As minister for Jerusalem affairs and heritage, Minister Elkin has worked hard to advance the status of the capital, and I am convinced that his great experience will help him lead the city in the next few years," added Bennett. Bennett added, "Elkin is an ideological right-winger who believes in the entirety of the land of Israel and holds values ​​identical to those of religious Zionism, whose members constitute a large and significant public in the city of Jerusalem. He is therefore the natural candidate for whom to express our support, alongside our complete support for the Jewish Home list headed by Hagit Moshe," he said. "I have no doubt that specifically Ze'ev, as someone who understands the complexities and challenges facing the city in recent years, will know how to move Jerusalem forward successfully in the future as well," Bennett said. “Jewish Home stands by him and will work for his success,” he promised.